Flamenco, Seville is considered its cradle. In fact a vast majority of famous flamenco artists were born or started their career in Seville. As result, the offer of flamenco is endless and you can choose among many options where flamenco dancing and singing are beautifully performed. Seville is an artistically diverse city and there are always lots of spectacles and shows going on. You can experience the authenticity of flamenco in large tablaos where glamour and luxury are very present – they are upscale places. Or you can go for a smaller, more intimate and traditional venue. Here, young local artists perform nightly in the main patio, in old but restored houses that were once a palace. Flamenco seems to be everywhere: in bars, from open windows in summertime or being performed out of the blue. Artists range from unknown young talents to internationally renowned ones, and the passion and sentiment are always present. 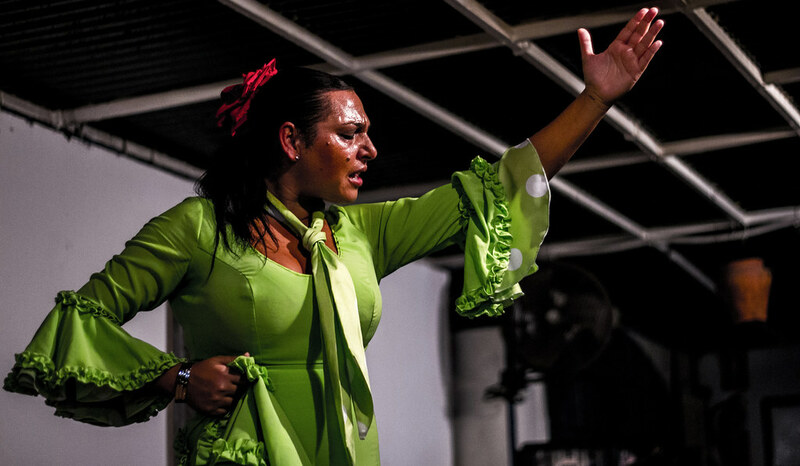 You’re in Seville… Live a little and find out what the flamenco fuss is all about! Tablaos offer a very professional show, where you can get to see the 3 forms of flamenco expression: singing, dancing and playing the guitar. In addition to this, every show has a great choreography allowing you to enjoy different palos. Besides the quality of the artists, the dresses and the set up are excellent. Tablaos are ideal for those inexperienced spectators that are willing to have a first approach to an espectáculo flamenco. If you are looking for a professional performance where you can enjoy cante, baile and toque, you should definitely go to a tablao. Flamenco art can be also experienced in smaller locales and events where, generally, the majority of the audience will be local. For obvious reasons, the group of people performing will also be smaller and you may only have the chance to see artists singing, or playing the guitar, without bailaores involved. These places are a little bit off the beaten path, and are much spectacular than what you can experience at a tablao. However, the intimate atmosphere, the reduced audience and the charming venues will provide a moment you won’t forget soon after. The images and sounds will remain deep in your soul. If you consider yourself a flamenco expert or you are looking for the ultimate experience, head to a bar flamenco. The atmosphere will be incredibly intimate because these are places where only Sevillanos go. Don’t expect to find anyone wearing a traditional dress or any professional flamenco dancing performance. Art here is spontaneous and most of the nights you’ll only watch cantaores or tocaores. Contrary to tablaos, shows at bares flamencos rely almost entirely on improvisation. Sometimes even a person from the audience may stand up and sing! Take Flamenco Lessons In Seville! One of the best ways to connect with the dancing culture of Seville is by taking flamenco lessons. The city is famous for being the origin of flamenco, and private courses are becoming more and more popular. This unforgettable experience will enhance your holiday – learn while having fun! Flamenco lessons are suitable for all, whether you have danced before or are a complete novice. The teacher will support you and adapt the lesson to your needs as much as possible. At the end of the flamenco lessons you will know about posture and position in dance, understand rhythms and body control, lose inhibitions and gain confidence. Have a look at a special map created especially for you. It shows the exact location of a long list of places where you can attend a flamenco show. All the most important venues are located – tablaos, smaller locales and bares flamencos. Pick the right one for you according to your preferences, your flamenco knowledge and the distance from your accommodation.